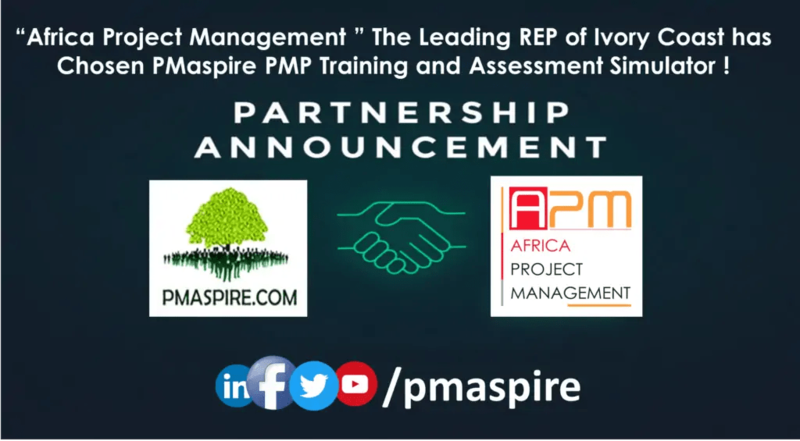 Africa Project Management(www.africaprojectmanagement.com), one of the leading Project Management Global REP (REP No: 4692) in Ivory Coast has Chosen PMaspire Singapore PTE. Ltd (www.pmaspire.com ) for PMP® Training Simulator to enrich their training quality. To kick off the Journey– Africa Project Managementhas bought PMaspire R.E.P/Training Simulator. REP/Training Simulator which is a simple yet powerful online training platform that lets PMP® Training Providers and Trainers to assess and measure learning of their Trainees readiness and can suggest before sitting the real PMP® exam. In this REP/Training platform, PMP® Training Providers and Trainers can also create and assign quizzes, share Presentation with other Trainers and Trainees in most secured way, Manage students database, class management and many more features. AFRICA PROJECT MANAGEMENT (APM) is a pioneer reference SARL in project management in Africa. APM has been running major projects across West Africa for more than four (04) years and wants to be the answer of the companies by supporting them in their development strategy. APM helps its customers achieve their business objectives by regularly executing projects with outstanding safety and environmental performance that meet cost, schedule and quality objectives. We base our performance on both internal and external ethical practices and believe that the keys to our success lie in the quality of our human resources. PMaspire is Technology Company focused on Project Management Simulation, Enterprise Exam Simulator and Training Simulation globally. PMaspire is the technology enabler for PMI Chapters, PMI REPs, Training Institute, Trainers and users. PMaspire has built a Cloud Enterprise Exam Simulator, which is the technology platform for professional exam preparation. PMaspire PMP® Exam Simulator is currently available in English, Arabic, Portuguese, Spanish, German, French and Chinese language. PMaspire has 350+ partners and helping project aspirants in 100+ countries through Multilingual Exam Simulator.